Reports that Greek officials sent the wrong document to European officials have been denied. Today's Eurogroup meeting, and even more importantly, the emergency heads of state meeting the only focus today. Initial indications from an aide to Juncker and EU's Moscovici are supporting that progress will be achieved today. This has lift European equity market, with Athens gaining over 8%, led by the banks, and a significant rally in peripheral bond yields. The recent negative contagion has been replaced with positive contagion. There has been no Greek bank holiday as some had feared. Nor have capital controls been instituted, as German newspapers had suggested were likely. For the third time in five days, the ECB has lifted the ELA ceiling. Reuters reports that weekend requests for deposit withdrawals over the weekend were near one billion euros on top of the 4 bln that apparently were withdrawn last week. On June 18 we suggested the framework for a compromise was emerging. The brinkmanship tactics on both sides had indeed carried the situation to the brink. We also identified that key was not coming from Greece's sovereign obligations, on which so many had focused. Rather our concern was with the Greek banks, the bleed of deposits amid (German) press reports playing up the imminence of capital controls. As was experienced in Cyprus, the capital controls included limits on ATM withdrawals. There is no formal mechanism to eject Greece from the monetary union, which by treaty is irrevocable. Claims that Greece should decided whether to be in EMU or not is to accept the framework that the creditors have put forward. Syriza was elected with a mandate to resist more austerity on an economy that is still contracting in nominal terms to o remain in the euro. Greece has not violated any high law in claiming its debt is unsustainable. Despite the pejorative claims of blackmail, Greece has said it wants to break the cycle of taking on more debt to service its existing debt. It is Greece, not the official creditors, who do not want to stick to the strategy of "extend and pretend." It is not clear that there will be an agreement today, but we do think both sides are moving to one in the near-term. The consequences of failure are potentially large and far-reaching. Although the creditors and their apologists have draped their arguments in terms in the morality of honoring one's debt, the fact of the matter is when the shoe has been on the other foot, they too have acted like debtors, seeking relief and forbearance. 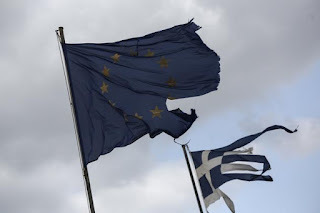 Moreover, with all the powerful aligned against it, Greece has become the David fighting Goliath. Contrary to the conventional wisdom, making a martyr out of Syriza risks not undermining other anti-austerity forces, like Podemos, but emboldening them. The Dow Jones Stoxx 600 is up 1.8%, led by telecom and consumer discretionary sectors. Financial are market performers. We note that the DAX has pushed through the 20-day moving average (11280) for the first time since May 29. The next key technical level is the down trend line drawn off the April 10 and May 26 highs, which comes in near 11615 today. We noted that the Nikkei had fallen through an 8-month uptrend that began shortly before the BOJ surprised the market at the end of last October by aggressively expanding its QE operations. We suggested that this could prove to be a false break. The Nikkei rallied 1.25% today. It closed back above the uptrend (~20290) and above the 20-day moving average (~20370). We disputed European official claims that contagion was limited. The Greek 10-year yields is off 140 bp today. Spain and Italy 10-year benchmark yields are off 12 bp, and Portugal's yield is off 17. Safe haven flows are reversing. German 10-year bund yield is up almost 9 bp, while the US similar US yield is up almost 7 bp. Although the bund and euro had seemed tightly linked previously, they seem to have become decoupled more recently. Greece will dominate the North American session today. However, this week's slew of US economic data is expected to confirm that the recovery from what will appear as stagnation in Q1. Consumption, capital expenditures and housing are set to improve. Today's data includes the Chicago Fed's National Activity Index. It is been in negative territory in the first four months of the year, but is expected to have turned positive in May. May existing home sales are expected to recover fully from the 3.3% decline in April. The consensus expected to seasonally adjusted annual rate to rise to 5.28 mln, which would be the highest since July 2013. The S&P 500 had its best week since April last week. It consolidated before the weekend, but is expected to recoup those losses in full at the open. The record high was set May 20 just below 2135.